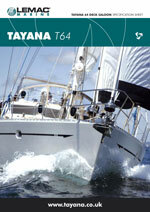 If you appreciate state of the art voyaging, your destination is the Tayana 64. Once aboard, the world is yours to roam. With tayana the ocean becomes your adventure playground.. and what better yacht to experience new horizons than the superb new Tayana 64. Tp 316 Stainless Steel shaft 1-3/4"
Lewmar Ocean series port lights on hull. Mooring cleats: Stainless steel 15" & 12"
Desalinator, washer/dryer, trash compactor, ice maker, dish washer, etc, are optionally available. If you would like to have a copy of the information provided to browse at your own leisure, then please download our PDF Brochures. If you are having trouble opening our brochure, it could be that you do not have Adobe Acrobat installed. To get Adobe Acrobat Reader so that you can read Adobe PDF files on your desktop or on the Web.